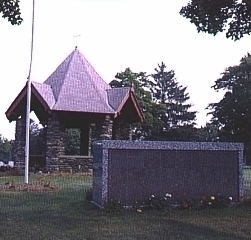 All Faiths Cemetery and Crematory, operated by the non-profit Swedish Cemetery Corporation since 1886, is proud of its long tradition of serving people of all faiths and nationalities. The cemetery provides a final resting place for the deceased in a setting of beauty, tranquility and quiet dignity, while the crematory offers a full line of crematory services. Our emphasis has always been on personal guidance and compassion, and our foremost goal is to make the passing of a loved one less difficult. Whatever your needs we stand ready to help. For those wishing a traditional burial, our cemetery is one of the most picturesque in the area. Beautifully landscaped and groomed, the cemetery provides the ultimate final resting place for a loved one. 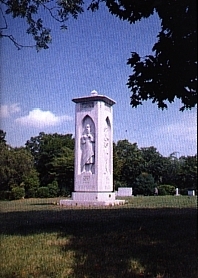 The centerpiece of the cemetery is the Apostles' Monument, a stately granite structure with likenesses of the apostles carved in each face. The cemetery maintains a large selection of lot locations and sizes. Several different payment options are available, including a prepayment plan. To permit individual expression, we allow great flexibility in styles and sizes of markers. The purchase of each grave site includes a "perpetual care" agreement which entitles the owner to complimentary lot maintenance into perpetuity. Cremation is gradually becoming a more common alternative to traditional burial. For those wishing cremation, we offer a full line of services. We provide an on-site crematory as well as several different options for placement of the remains. The ashes may be retained by the family, buried at a traditional grave site, or retained in either of two special locations at the cemetery. One location is a lovely urn garden, an area specifically designed for urn burial. The other is a columbarium, an attractive free-standing granite structure on the site of the urn garden which allows ashes to be stored above ground in individual chambers bearing grave markers. Additional details about the cremation process are available. The staff at All Faiths consists of a devoted group of concerned and experienced personnel. The proper operation of the cemetery and crematory is their charge and their proud achievement. Most important, however, is their unselfish desire to assist the bereaved through loving and compassionate service. Copyright © 2010 All Faiths Cemetery and Crematory (Est. 1886). All Rights Reserved.